Beautiful floral designs from local award-winning florist, Catoosa Flowers. 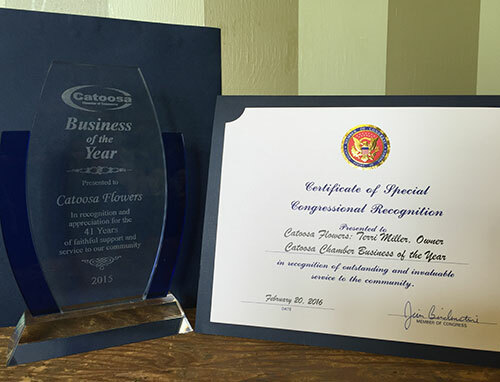 Catoosa Flowers is a family-owned, full service flower shop that has been located on Route 66 since 1966. Our shop has been delivering beautiful flowers to the Tulsa and Rogers County areas for over 50 years, Daily deliveries are made to Tulsa, Broken Arrow, Owasso, Claremore, Verdigris and all of the metro Tulsa area. Delivery is available to any area residence, business, hospital, nursing home or funeral home. We are also able to send flowers for you to any location world wide through our network of professional florists. Every arrangement is created by hand by one of our skilled designers. Usually when you call the shop you will be speaking personally to the designer that will make your arrangement. Special attention is paid to make sure that each arrangement is hand crafted to be just the exact style for your needs. From a simple birthday wish to that Special Wedding Day, we can help you choose the perfect flowers for any occasion.